Note: This puzzle was inspired by the one here, by Mike Q. Every square in the grid above, when the puzzle is complete, has a number between 1 and 9 in it and either is shaded or is not. Each 3x3 square in the grid contains exactly 4 shaded squares, forming an L, T, or S tetromino, which can be rotated or mirrored and can be placed anywhere in the square. 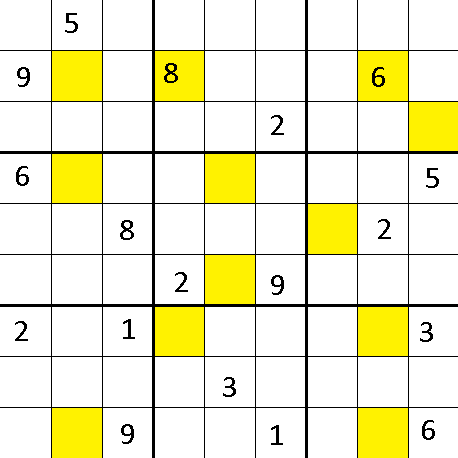 Note that while the yellow squares in the given grid are confirmed shaded, the other squares all may or may not be shaded- no square in the given grid is confirmed unshaded yet. The shaded squares follow the additional rules that they form a contiguous path with no 2x2 squares shaded, and that any unshaded region (that is, any collection of adjacent unshaded squares) must be directly adjacent to the edge of the grid (the following, for example, would not be allowed, as the center region is not adjacent to the edge.). 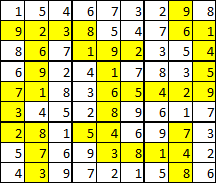 Finally, the numbers follow the normal rules of sudoku, with the addition that the four numbers in each tetromino must add up to 20, and that no two tetrominoes share the same set of four numbers. One diagonal must have three of the same tetromino, while the other must have one of each. If a corner square is shaded, the opposite corner cannot be. If two squares on opposite sides are shaded, the square between them must be shaded as well. Note that only four out of the twelve sets of numbers contain a 5, only two lack a 1 and a 2, and only three lack both a 3 and a 6. You should be able to tell straight away that the center and lower-right sections contain either T or L tetrominoes, since they have a line of three shaded squares in a row. This divides possible solutions into four categories (numbering the sections with the equivalent on the number pad): 5T-3T, 5T-3L, 5L-3T, and 5L-3L. The second of these can have the shading completely determined using only the shading rules, and then be quickly eliminated using the sudoku/add-to-20 rules, while the third reduces to two almost-complete shadings depending on the orientation of the 3T. Some brute force is required, but by paying attention to where 9s have to go and how many sections have neither a 1 nor a 2 shaded, both can be eliminated. The techniques you use here should help figure out the rest. Since there are still no answers, here's one last hint. If there are still no answers a week or so from now, I'll go ahead and post the solution. The last possibility of the previous hint reduces to three cases depending on the lower-center and lower-right regions. If the upper-left corner of the lower-center region is shaded, and the upper-right corner of the lower-right region is not, the center-left region cannot be shaded properly, and if both are shaded the center-right cannot. If the center-left has unshaded upper-right corner, the region's (and most of the puzzle's) shading is determined by whether it contains a T or an S tetromino. In the former case, the upper-center region quickly becomes impossible to number once a few of the 9's are figured out while in the latter the upper-left proves impossible to number. This confirms that both the center and the lower-right regions (and thus the upper-left) must contain T tetrominoes. It is subsequently easy to determine that the upper-right region must contain an S tetromino, which determines most of the shading. After this, which of two sets of numbers go in the center-left region, which of two possible shadings the upper-left region has, and which (if any) of the regions have neither 1 nor 2 shaded determine the remainder of the puzzle. It seems I managed to make all incorrect guesses first, so (even without OP) I'm convinced that the solution is unique. Here's the full solution, following through the hints I gave in the question body. I must apologize, as the third spoilered paragraph turned out to be much more difficult than I thought at first. and will use the same numbers to refer to a square within a section, so for example, square 5-9 is the upper-right hand corner square of the central 3x3 region. !WARNING! since multiline preformatted text blocks cannot be put in spoilers, some diagrams will be visible, though without context. In the first shading, again, 2-4 is forced to be 9, as is 8-2, while section 4 is forced to have (2 3 6 9) shaded. If section 7 has the 5 in 7-8 shaded, which forces (2 5 6 7), Section 9 must have (1 5 6 8) or (3 4 6 7). If 7-8 is not shaded, 2 must be in one of section 7's shaded squares, and 7-2 is forced to be 8 as part of (2 3 7 8) or (2 4 6 8). In the latter case, section 1 cannot have a shaded 8, so must have a shaded 9, so 1-3 and 1-6 are forced to be shaded. In the other two, since sections 8, 5, 2 and 9 must all have one of (1 4 7 8), (1 5 6 8), (3 4 5 8) or (3 4 6 7) shaded, no other section, in particular section 1, can have any of those sets of numbers shaded, which again forces 1-3 and 1-6 to be shaded. Section 1 must thus have (1 3 7 9) or (1 4 6 9) shaded, so 1-6 is either 6 or 7, 4-9 is either 2 or 3, and 4-3 must be 5. 7-9, 7-6, and 7-3 must then be in some order a 4, one of 2 or 3, and one of 6 or 7. If section 7 has (2 4 6 8) shaded, it forces 1-2 to be 3 which in turn forces 7-3 and 4-9 to be 3, so that doesn't work. If section 7 has (2 3 7 8) shaded, 1-1 and 1-4 are forced to be 3 and 5, and section 1 can't contain an 8. If section 7 has (2 5 6 7) shaded, and section 9 has (1 5 6 8), section 8 cannot have a 5 filled in, and finally if section 9 has (3 4 6 7) shaded, 8-8 is forced to be 6, which forces section 5 to have (1 4 7 8) shaded, which leaves 5-9 impossible to fill. Again, apologies for the preceeding paragraph. I made a mistake in my earlier solution which would have made this section much shorter. Again, 2-4 is forced to be 9, and section 4 is forced to either (1 3 7 9) or (2 4 5 9). In the latter case, 1-6 is forced to 5, which forces 1-7 to be shaded and prevents 1-9, 1-6 or 1-5 from being shaded, and 4-5 and 4-8 are forced to 9 and 2. The T tetromino in section 7 is either right-side-up (so 7-4 is shaded) and has (2 3 6 9) shaded or up-side-down and has (1 4 7 8) shaded. Right-side-up forces 7-6 to be 2, which forces 1-8, 1-5, and 1-2 to be 7, 8 and 4 in some order, which makes section 1 impossible to fill in, while up-side-down forces 7-1 to be 1, 7-3 to be 4, and 1-2 to be 3, with 1-5 and 1-8 being 4 and 6 in some order and 1-4 and 1-1 having 7 and 8 and being shaded. Section 8 can no longer be properly shaded without conflicting with section 1 or being impossible to fill, so section 4 must have had (1 3 7 9) all along, forcing 4-9 to be 2, 4-2 to be 4 and 4-3 to be 5. This in turn forces 7-1 or 7-7 to be 1, so 4-4 and 4-1 are 3 and 7 in some order and 1-2 is 3. 1-9 now cannot be shaded without causing an eventual conflict with section 4, so 1-7 must be shaded, and section 1 is forced to (2 3 7 8) which forces 1-6 to 6. The T tetromino in section 7 now must have a shaded 2 at 7-5 and 6 at 7-2, so it's either (2 4 6 8) or (2 3 6 9). Now consider section 2: if it has (3 4 6 7), then 3-1 and 3-2 are forced to be 7 and 8, so section 3 is forced to (1 2 8 9). Section 9 is forced to (1 4 6 9) and 9-2 is forced to 5, leaving section 6 with 5 and either exactly one of 3/7 OR 2 shaded, which is impossible to complete, so section 2 must have (3 4 5 8) shaded. Since 7-3 can't be a 3 and section 8 can't have a shaded 3 anymore, 9-1 or 9-2 must be 3 and section 9 must be (1 4 6 9). Since section 8 needs a shaded 1, 9-6 must be 1. If the T in section 7 were upside-down, 7-3 would be 4 and 9-3 would be 9, which would force 8-7 to be shaded and 6, which forces section 5 to have a shaded 6 which forces it to be (3 4 6 7) to avoid conflicts with section 8, which forces 5-4 and 8-2 to be 5 and 8-1 to be 1, and prevents section 5 from containing a 1, so the T must be right-side-up and 7-6 is 3. Now, if 3-8 is 9, 9-8 is 4 and 3-5 and 3-2 are 1 and 8, which again leaves section 6 impossible to number. So 3-7 must be 9, section 3 has (1 4 7 8), 9-8 is 9, section 8 has (1 2 8 9) and the rest of the puzzle is easily solved. Not the answer you're looking for? Browse other questions tagged grid-deduction sudoku polyomino or ask your own question.